Born in Birkenhead in 1901. Fred’s mother was Christina SMITH, a teacher and William NAYLOR, who worked at the Vulcan works in St Helens and later in other factories, eventually running the family shop in Kirkdale. The family moved to Liverpool when he was a small child - his younger sister Agnes was born in Liverpool about 1904. 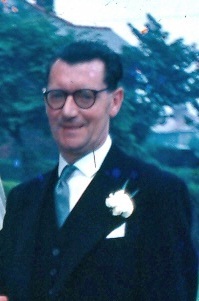 Fred NAYLOR attended the Catholic Institute in St Domingo Vale (later St Edward’s), with his great friend Joe COGHLAN. He went on to Liverpool University, where he got a BSc in Science. He had a letter of introduction to someone (Maximillian?) who had gone away, so he couldn’t confirm the appointment. At that time, his father died, and he had to make a decision about his career, so he chose teaching. I am fairly sure that during his life, Fred NAYLOR (my grandfather) taught at St John’s RC in Kirkdale and from there to the post of headteacher at St Philomena’s in Sparrowhall. Granda always cycled to school until he was in his 60s, when he took his test. He retired in the 1960s at the age of 62.